When we observe a supernova, we can identify its type by looking at its spectrum. Supernovae that have strong hydrogen lines are known as type II, and are caused by the core collapse of a star at the end of its life. Stars without a strong hydrogen line are known as type I, and there’s a variation of type I supernovae with a strong silicon line known as type Ia. This last variety is particularly useful for astronomers, because they always have about the same absolute magnitude. This means they can be used as “standard candles” to determine the distance of a galaxy. While we know type Ia supernovae are not caused by the core collapse of a large star, we aren’t entirely sure what triggers them. There are two main models for type Ia supernovae. The first is that they are caused when a white dwarf star closely orbits a companion star. The outer layer of the companion star can be gravitationally captured by the white dwarf, which causes a runaway fusion process that results in a supernova. 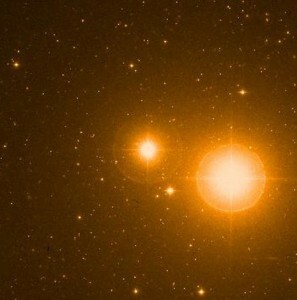 The other is that they are triggered by the collision of two white dwarfs. Understanding the origin of these supernovae is important, particularly in light of the fact that there is some evidence they might not be as standard as we thought. One of the challenges with studying these supernovae is that they typically occur in other galaxies. There hasn’t been a clear supernova in our own galaxy for several hundred years, even though there’s evidence that one occurs in our galaxy about every 50 years. This is likely due to the fact that much of our galaxy is blocked by gas and dust, making them difficult to observe. But recently observations from the Chandra x-ray observatory have found the remnant of a supernova in our galaxy that occurred about 110 years ago. Since it’s in a region of the galaxy rich in dust, the visible light from the supernova was obscured, which is why astronomers at the time didn’t see it. Looking through archive data from Chandra, a team found the remnant has been increasing in brightness at x-ray and radio wavelengths as the remnant interacts with interstellar gas and dust. Such an increase is what you’d expect from the collision model of type Ia supernovae, but not the binary model. While this supports the idea that type Ia supernovae can occur from white dwarf mergers, it doesn’t necessarily mean that they can’t occur through a dance of binary stars as well. It’s possible that both mechanisms can produce supernovae of this type. It will take more observations to determine whether mergers are the only cause.